Want to be notified of new releases in ridesafe/ridesafe-android? RideSafe is an open source project which detects bikers' falls. This is possible thanks to intelligent algorithms and data collection. Our smartphones have accelerometers to measure acceleration gyroscope forces of individuals, these data can be used to analyse the behaviour: when walking, running, biking and even falling ! The self learning algorithms are able to improve the detection of a fall by analysing such data. 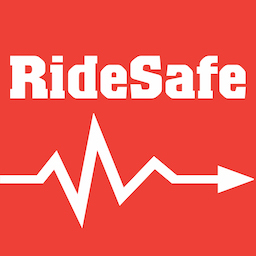 The RideSafe lib is in charge of getting accelerometer and gyroscope data (timestamp, acc_x², acc_y², acc_z², gyr_x, gyr_y, gyr_z) from your smartphone and then ship them to the RideSafe Backend. RideSafe needs accelerometer data to detect bikers' falls. Once the lib installed and configured on your app, this will listen for new accelerometer events, storing them in memory (very tiny footprint) before shipping them to the backend. There are many ways to contribute to RideSafe. You are data scientist: Take a look at our activity recognition algorithms and tell us what do you think and how to improve them. You are motorcycling professional: More we can test, more accurate are algorithms and fall detection. Contact us to see how you can contribute ! RideSafe is used into our Nousmotards app. We are creating a set of services tailored exclusively to the world of motorcycling! Nousmotards app is available on Mobile (Android, iOS) and on your browser. We are looking for worldwide partners specialised in motorbike and/or technology. The "Activity Recognition" project is based on the work of Ludwine Probst, which detects one type of activity from the accelerometer integrated in smartphones and a self-learning algorithm called machine learning. The data and algorithms are available under the Apache license, this means that the changes and improvements made will be communicated to the community. Commercial use is unrestricted.